There is 'conclusive proof' to link the arrested activists to Maoists, police on Friday said, adding a letter exchanged by an arrested activist spoke of planning a 'Rajiv Gandhi-like incident to end Modi-raj'. An email letter between Rona Wilson and a Communist Party of India-Maoist leader speaks of ending 'Modi-raj' with a 'Rajiv Gandhi-type incident', Maharashtra police additional director general (law and order) Parambir Singh told reporters in Mumbai. Human rights activist Rona Jacob Wilson was arrested from Delhi in June in connection with the Koregaon-Bhima violence in Maharashtra in January this year. The letter also mentioned that Rs 8 crore were needed for procuring grenade launchers, he said. Police have seized 'thousands of letters' exchanged between the over-ground and the underground of Maoists, the police officer said. "The letter written by Rona to Maoist leader 'Comrade Prakash' said: We have received your last letter regarding current situation here. Arun (Ferreira), Vernon (Gonsalves) and others are equally concerned about the urban front struggle," he said. "The letter also spoke of requirement of Rs 8 crore for annual supply of grenade launcher with four lakh rounds," he said. The letter asked Prakash to convey his decision, Singh said. "Comrade Kisan and a few other comrades have proposed concrete steps to end Modi raj. We are thinking along the lines of another Rajiv Gandhi (assassination)-like incident," Singh quoted the letter as saying. Some of the letters exchanged between the arrested activists spoke of planning 'some big action' which would attract attention, Singh said. Delhi University professor G N Saibaba was arrested in 2014 on basis of similar evidence, including letters, he said. On the arrests of activists with alleged links to Maoists in June and earlier this week, the police officer said, "Police only moved to take action against these people when we were confident that clear links have been established between these overground activists and underground Maoists." "The evidence in our possession clearly establishes their (arrested activists’) links with Maoists," Singh said. Information obtained after seizure of such letters and other items shows the involvement of 'over-ground' Maoist cadres in planning subversive acts, he said. The central committee of Maoists communicated with these activists through password protected messages sent via courier, he added. After the Elgaar Parishad at Pune on December 31, a case was registered by police on January 8 about the event where hate speeches were delivered, he said. Most of them (who allegedly delivered the hate speeches) were associated with Kabir Kala Manch, he said. "Our investigation revealed that a big conspiracy was being plotted by Maoist organisations and the accused were helping them to take their goals forward," Singh said. Some of the activists arrested held meetings abroad and were in touch with organisations there, police said. There is a reference to the meetings in Paris and some other countries in the letters recovered from activists arrested in June and this week , Singh told reporters. "They were also in touch with (similar) organisations of the other countries and were co-ordinating with them to highlight (their issues)," he said. The letters mention ‘meetings of philosophers’ held in France and the US, he said. He did not mention the time-frame of any of the meetings held abroad. A letter written by Maoist functionary Comrade Prakash to activist Anand Teltumbde mentions the need to highlight the issue (Koregoan-Bhima violence) at international level, he said. ‘Many like-minded activists and groups joined forces with us to highlight the oppression of Dalits and minorities,’ a letter by Prakash said. "The central committee (of Maoists) has agreed to allocate additional funds of Rs 10 lakh to hold international seminars and conferences on Dalit issues," Singh quoted Prakash as writing in the letter. Prakash also mentioned about sending funds for a human rights convention in Paris, which scheduled to be attended by Teltumbde. "The arrested accused were spreading the Maoist agenda among students and youth," Singh said. "They were brainwashing students of JNU (Jawaharlal Nehru University) and TISS (Tata Institute of Social Sciences) to engage in underground work and insurgency," he said. The arrested activists were also trying to establish a nationwide front to overthrow the government, he said. Gujarat Dalit leader Jignesh Mevani and JNU student leader Umar Khalid were in the investigation ambit for alleged hate speeches at Elgaar Parishad, he said. Some of the arrested activists had given Rs 15 lakh for organising the Elgaar Parishad at Pune on December 31, Singh said. The funds came from the central committee of Maoists, he added. The police also claimed that a letter recovered from the laptop of Rona Wilson shows that Telugu poet Varavara Rao played a role in weapon procurement. The letter speaks about procurement of arms and ammunition, Singh said. "I have been in touch with designated contact in Nepal (for weapon procurement). Our comrades in Manipur can also assist in this. But, only V V (Varavara Rao) is authorised to communicate with them," Singh said, quoting one of the purportedly seized letter. "It would benefit us to fast track the process and get equipments ready on ground. We are losing dozens and dozens of comrades in encounters in different states," the letter, allegedly written by Wilson to ‘comrade Prakash’ said. Surendra Gadling (arrested in June) and Rao felt the need to inflict heavy casualties on ‘enemy’, something which the Maoists had not been able to do since 2013, ADG Singh claimed, quoting the letter. Wilson also sent a catalogue of weapons with the letter, which had pictures and descriptions of a Russian-made grenade launcher, Chinese-made automatic grenade launcher and a machine gun, the senior police officer claimed. ‘Comrade Prakash’ was a conduit between the accused and the top Maoist leader Ganapathy and the ‘central committee’ of the banned CPI (Maoist), Singh said. The letters would be copied on ‘hard drives’ and these hard drives were then couriered, ADG Singh said, adding that the drives would be password-protected. The police are also probing the funding which Maoist received from abroad, he said. Singh also said that one of seized letters showed that Maoists suffered due to demonetisation of November 2016. Gadling, in reply to a letter by Rao in March 2017, said he could not distribute funds in Gadchiroli (in Maharashtra) and Chhattisgarh as police were carrying out frequent checks in the wake of note-ban, the ADG said. Singh also said, without giving details, that some letters indicated that Maoists were helping some militant groups and ‘stone throwers’ in Jammu and Kashmir. On April 17, raids were conducted at six places, based on the information available, he said. The raids were video-graphed and there was proper 'panchnama', he added. On May 17, sections under the Unlawful Activities (Prevention) Act were evoked against the activists, he said. 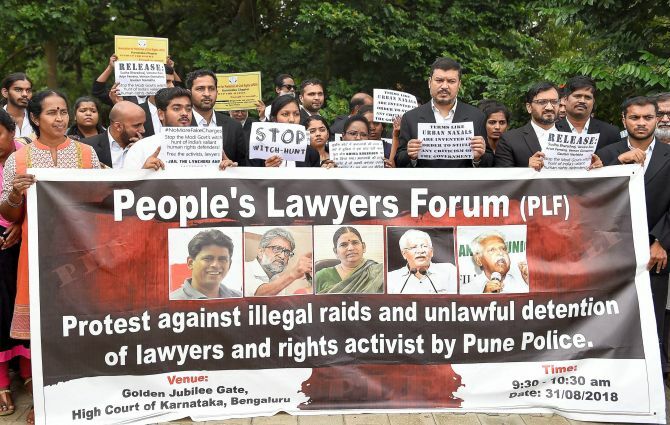 Pune police had on August 28 raided the homes of prominent Left-wing activists in several states and arrested five of them -- Varavara Rao in Hyderabad, Vernon Gonsalves and Arun Ferreira in Mumbai, Sudha Bharadwaj in Faridabad and Gautam Navalakha in Delhi. The raids were carried out as part of a probe into the Elgaar Parishad, which allegedly triggered violence at Koregaon-Bhima in Pune district the next day. The Supreme Court has ordered that the five should be kept under house arrest till September 6. In June, Pune police had arrested Sudhir Dhawale from Mumbai, activist Rona Wilson from Delhi and lawyer Surendra Gadling, professor Shoma Sen and Adivasi rights activist Mahesh Raut from Nagpur. Meanwhile, the Congress on Friday asked why the government's top investigative agency, the National Investigation Agency (NIA), was not involved in probing the alleged plot to assassinate the prime minister. Congress spokesperson Abhishek Singhvi said, "Does common sense tell that there is a possible assassination plot against the prime minister, which he condemned, but asked why the country's top probe agencies were not involved and it was left to the Pune Police to carry out investigations." "I am gravely concerned about the security of the prime minister if you are leaving the matter like this to the Pune Police," he said. "Nobody in the right mind should be supported who is trying to attack the Prime Minister of India. Do you think that an illusion of grandeur that the Pune Police is in-charge of investigation and the NIA is nowhere to be seen, CBI is nowhere to be seen? "The biggest investigative agency of our country are not to be seen in the PM's part of assassination attempt and the Pune Police is in-charge? I find it absurd," he told reporters. On being asked if the Congress wanted an NIA probe, Singhvi said one can imagine if the charge was credible and serious. "The NIA, the home minister, the CBI (Central Bureau of Investigation), the RAW (Research and Analysis Wing) and the IB (Intelligence Bureau) should be involved," he said. He said the head of the government is involved as a possible target and ‘you are talking through the person who is having the press conference of the Pune Police’. Singhvi said he may not agree with poet-activist Varavara Rao on the way he writes or with rights activists Gautam Navlakha's views, but the true test of democracy is as Voltaire rightly said, ‘I disapprove of what you say, but I will defend to the death your right to say it’.